Infinix Product are very Amazing, now you can upgrade your Infinix Zero Plus (X602) to Nougat Version, it has received a Nougat roll out from the manufacture. The update can be installed using OTA (over-the-air) method which is the simplest method in updating smartphone from a particular operating system to another. Before you start make sure your battery is charged Unroot your phone if rooted and carefully follow this procedure below. Go to "Settings" from your Android phone and tap on "About phone". Tap on "System updates" and tap on "Download and Install". Your phone will power off automatically and Install the update and reboot again by itself to present the new Android 7.1.1 Nougat Update interface and features. Update system from 6.0 marshmallow to 7.1.1 Nougat. Supports split screen by long pressing recent button in some partial apps. Comes with brand new pull down shortcuts bar. It fixed partial camera issues to improve camera stability. It fixed compability issues in some third-party softwares. Added security shutdown mode when long pressing the power button to shut down the device. Merged lucid power saving algorithm to support more lasting standby. Optimized the focusing effect to improve the success rate. Optimized the camera effects to improve shooting experience. Added power saving algorithm to extend battery life. Added horizontal swipe to change wallpapers in Magazine lockscreen interface. Brand new Music 2.0 optimized the interface display. Auto-centered the icons in the duck bar. If you Encounter any problems or issues? Kindly drop your questions below in the comment box. 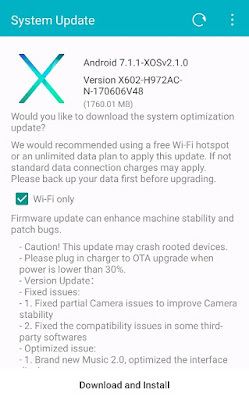 0 Response to " How to Update Your Infinix Zero 4 Plus (X602) to Nougat Version"